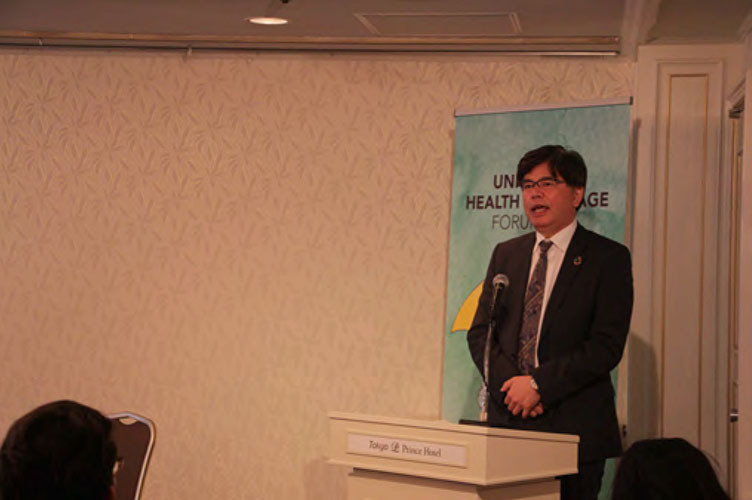 The Universal Health Coverage (UHC) Forum in Tokyo, timed to commemorate UHC Day, was a historic gathering of high-level participants, including heads of State, ministers of health and finance, and leaders representing bilateral and multilateral institutions, civil society, academia and the private sector. The forum aimed to stimulate global and country-level progress towards UHC by reviewing progress and sharing country experiences. The Forum featured a day of ministerial and technical discussions, followed by a day of high-level plenary sessions. 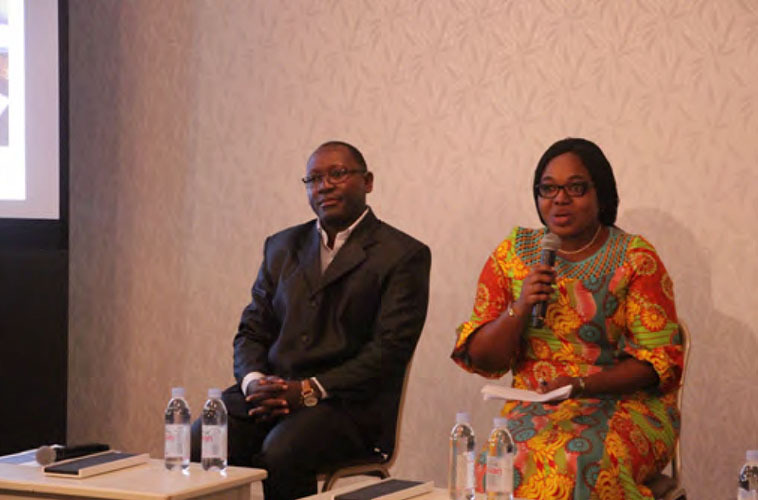 Several partners, including UNDP, hosted side events that showcased some of the diverse multi-sectoral initiatives that are helping to accelerate progress on UHC. 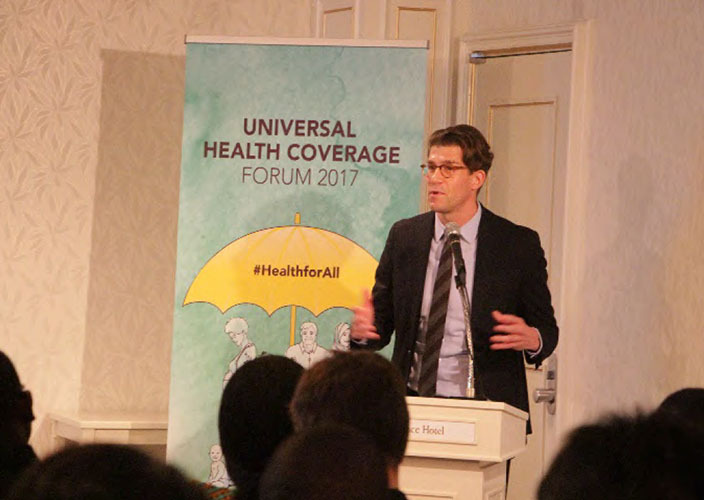 UNDP and the GHIT Fund co-hosted a side event, 'Innovation, Access and Delivery for Universal Health Coverage', on 12 December 2017 at the UHC Forum in Tokyo, Japan. The side event highlighted the need for coordinated investments in innovation and health care access and delivery to achieve UHC and showcased the important work being done by the GHIT Fund and the Access and Delivery Partnership – two initiatives supported by the Government of Japan and for which UNDP is a key partner. 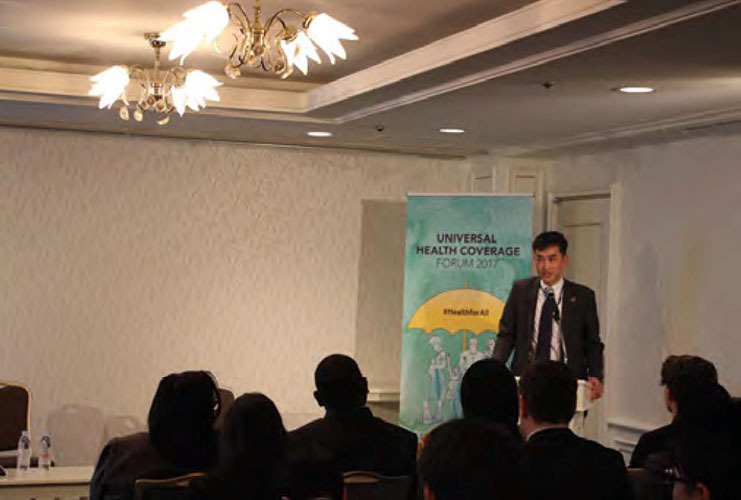 Representatives from the Government of Japan, the World Health Organization, the GHIT Fund, the Access and Delivery Partnership and UNDP offered their unique perspectives on the work they are doing to advance UHC and spoke about why innovation and improved access and delivery are critical to achieving UHC. BT Slingsby, Chief Executive Officer of the GHIT Fund, spoke about the GHIT Fund and its work to invest in the discovery and development of lifesaving medicines, vaccines and diagnostics. He emphasized the GHIT Fund's commitment to developing innovations that will improve the lives of some of the poorest and most disadvantaged people around the world. The GHIT Fund – a partnership between the Government of Japan and UNDP, in collaboration with the Bill & Melinda Gates Foundation, Wellcome Trust and a group of Japanese pharmaceutical companies – invests in medicines and other technologies with the potential to transform the lives of the world’s most vulnerable people. The Access and Delivery Partnership – a partnership between UNDP, the World Health Organization’s Special Programme for Research and Training in Tropical Diseases and PATH – helps countries strengthen their health systems and improve their capacities to deliver new health technologies to people who need them. Margaret Gyapong, Professor and Director of the Center for Health Policy and Implementation Research at the University of Health and Allied Sciences in the Volta Region of Ghana, and Frank Komakoma, Drug Logistics Officer at the Neglected Tropical Diseases Control Program in Tanzania, spoke about their experiences working with the Access and Delivery Partnership to strengthen health systems and build national capacities in their home countries of Ghana and Tanzania, respectively. Margaret Gyapong offered an example of how the Access and Delivery Partnership supported Ghana’s Ministry of Health to develop the country’s National Medicines Policy, including by developing evidence-based guidelines on which medicines to include and pricing them to achieve the greatest impact. She also discussed how research can help identify and overcome health system bottlenecks, ensuring that innovations get to the people who need them. Frank Komakoma spoke about his work with the Access and Delivery Partnership to improve the management of neglected tropical diseases (NTDs) in Tanzania. Noting the health workforce issues that Tanzania is facing and the urgent need for better training guidelines, he spoke about the work that the Access and Delivery Partnership is doing to improve guidelines and ensure that NTD treatment programs are run effectively and that valuable medicines are not wasted. Mandeep Dhaliwal, Director of HIV, Health and Development at UNDP, moderated the discussion. In her remarks at the event, she emphasized that the important work being done by the Access and Delivery Partnership – and the complementary efforts of the GHIT Fund – would not have been possible without the Government of Japan's commitment to promoting innovation, access to and the delivery of health technologies in low- and middle-income countries. Since 2013 the Government of Japan has collaborated with UNDP to implement the GHIT Fund and the Access and Delivery Partnership. Investing in the development and delivery of medicines, vaccines and diagnostics is critical to achieve UHC – one of the Government of Japan's key priorities. Tamaki Tsukada, Deputy Assistant Minister for International Cooperation and Global Issues in the Government of Japan, spoke at the side event, highlighting the government's commitment to the two initiatives and discussing why innovation, access and delivery are all essential to achieve UHC. Naoko Yamamoto, Assistant Director-General for Universal Health Coverage and Health Systems Cluster at the World Health Organization, and former Senior Assistant Minister for Global Health in Japan's Ministry of Health, Labour and Welfare, spoke about the need for strong commitment, Japan's exemplary leadership on UHC and emphasized the World Health Organization's commitment to the issue. Tetsuo Kondo, Director of UNDP Tokyo, closed the side event and introduced a new, UNDP-supported photography exhibition entitled 'Innovation & Inequality.' The photography series highlighted life-saving health innovations and the tragic inequalities that stand in the way of people accessing them. Fifteen award-winning photographers from around the world contributed images to the exhibition. The photographs represented diverse people, countries and issues, including a child in Uganda who is receiving a new rapid diagnostic test for malaria, thanks to the efforts of community health workers who travel from door to door; a woman in Madagascar receiving a contraceptive implant, possibly for the last time due to changes in global politics; victims of the Ebola epidemic in Sierra Leone who died because the world had not invested in tools to combat the disease; and many more.